You’ve heard a great deal about my project in Bridgehampton; it’s been a year in development. Finally, the first stage of construction has started — we are repurposing a free-standing rustic garage into a guest house. I am busy making sure that all of the elements come together seamlessly. 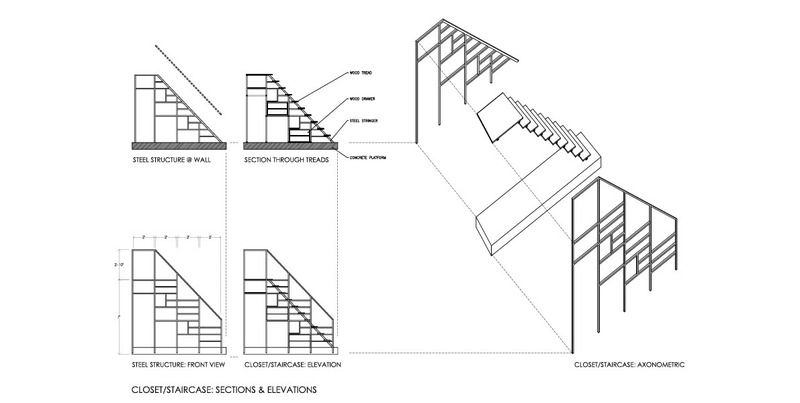 Still refining the design for a closet that doubles as a staircase leading up to a new loft. The overall layout is set, but I can’t let go. Now is the time to avoid trivial solutions. The simplest and least labor-intensive method of building a staircase is to install cutout timber stringers upon which the treads rest. However, that would be too obvious and too bulky. My goal is to provide a striking focal point. A statement piece — something unexpected. In addition to bringing the outside in, I like mixing period-appropriate and industrial. Evoking bold solutions to functional needs, such as lack of closet space, can be extremely exciting. Paying close attention to the way each square inch of the space is used, I aim to create personalized and fresh details. In my mind, integration of contemporary with bucolic elements translates into refined and elegant. Here’s a great example. Union of form, function, and merit is the intent. 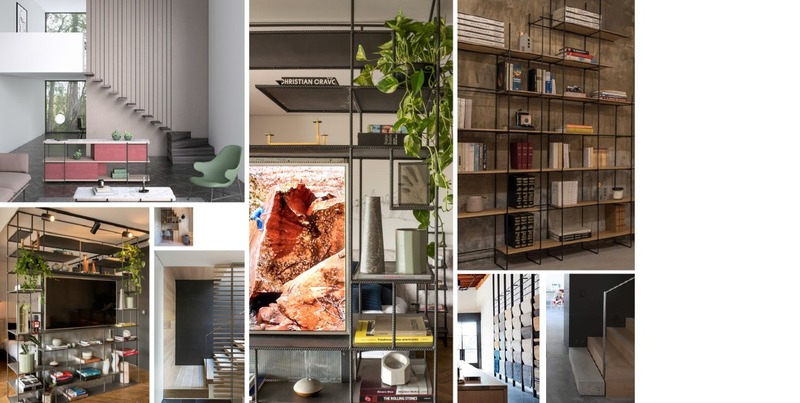 A mood board conjures up inspiration; it also communicates emerging ideas for the closet slash staircase to the client and the contractor. I am envisioning a floor-to-loft shelving unit made of 1”x1” steel tubing, which will be constructed to act as a ladder with storage underneath. It’ll accommodate long hanging, a place to stash a suitcase, and a few drawers. Need to build a quick model out of paper (see cover image) to test volumetrically. I see this free-standing sculpturally-minimal staircase as a grounding element. It anchors the loft floating above. 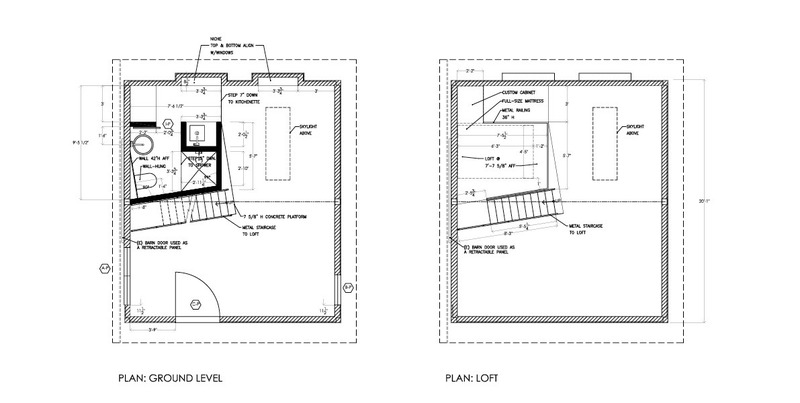 On the bottom, the staircase will be attached to a concrete platform, one riser in height. A ledge spilling into the room, it will double as a base for the closet, making its own graphic statement. Smooth and sleek steel structure will be paired with the treads of natural wood (as well as shelves and drawers) for warmth and functional ease… There. I’ve drawn and described. Handing over to skilled craftsmen. Hopefully, it will turn out even better than I’ve imagined. I’m sure it will turn out better than you imagined! I love the idea of “mixing period-appropriate and industrial,” that’s my aesthetic too. You are masterful at creating bold solutions to functional needs, this is no exception. This project is going to be absolutely fantastic. As I know from firsthand experience that when you care about the project and client, the outcome is phenomenal. A great thing about you is that you care about all of your clients and their projects! These are great compliments!! Thank you, Mia!